What happens on a damp survey? 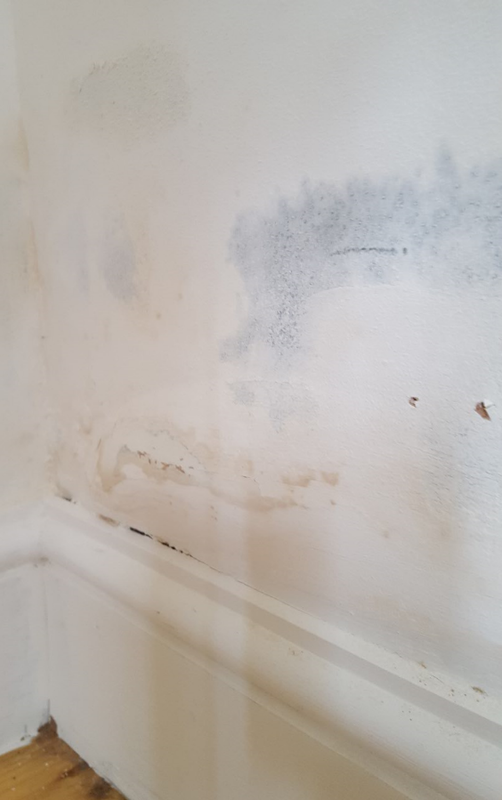 A property purchaser, who has had a structural survey carried out and damp issues have been highlighted, with the recommendations of a further survey to be carried out by a PCA affiliated Company. A building contractor who is working on a property and found damp problems. A property management company who has been informed of damp issues by their tenants. Preservation Treatments have been carrying out surveys on buildings to identify damp issues for over 45 years and the following will hopefully provide an idea as to what will happen when one of our qualified CSRT Surveyors arrives at your property. Damp is a common issue and affects a large number of homes in many different ways. At the one end it can appear to be very small amounts of dampness. However, at the other end of the scale, damp can cause real damage to a building, which can result in extensive damage to wall plaster, wood-rotting fungi affecting structural timbers, which can result in difficulties selling a house, where potential buyers and mortgage lenders are put off. In all cases, whether the damp problem is perceived to be small or large, they are all treated with the same importance. On occasions a damp report is merely asked for as a precaution i.e. there may be no suspected problem, but the valuer or surveyor wants to double check, to protect their client from a nasty surprise at a later date. It would be helpful if you have had a Homebuyers/Structural Report carried out, which has highlighted damp areas of concern, that you forward us a copy of the report at the time of arranging the survey. Essentially, the survey starts as our Surveyor arrives and starts walking up to the entrance door. The Surveyor is assessing the general construction of the property and at this stage is also mentally noting the overall condition of it. Our Surveyor will introduce himself to the person at the property and will usually ask some questions, such as; “are there specific damp problems which you are aware of”? and, “are you aware of any previous treatments at the property and / or any existing guarantees in respect of previous damp proofing work”? Some of these points will have been clarified at the time of booking the survey and where applicable, will be noted on our Surveyor’s instruction sheet. Once introductions and initial discussions have taken place, our Surveyor will then carry out a general inspection externally to check for obvious signs of defects which could result in damp ingress. Also, he will be assessing the construction detail, such as whether the walls are solid, cavity construction, whether there is a physical damp proof course visible etc. When looking for signs of damp ingress from defects in the fabric of the property, our Surveyor will be looking for any unusual features, defects in external gutters and down-pipes (rainwater goods), loose or missing pointing, cracks in external render coatings, poorly maintained external decorations, gaps around door and window frames, defective roof coverings, flashings etc. and whether there are areas of high external ground level which could result in damp “bridging” to name some items. This list is not exhaustive. This part of the survey should not take long for an experienced Surveyor, who will know what he or she is looking for. Following an external inspection, the internal survey will be carried out which could be a general inspection, or, be restricted to a specific area where a problem has been identified. While the surveyor has been going around the outside of the property, he will already have a good idea of where any damp problems may be, which may not be related to rising damp issues. To check the walls where there are no apparent visual signs of damp (but where his observations lead him), in case the damp problem is new and hasn’t damaged the decorations yet (or has possibly been masked by recent decoration). Plus; where a visual problem is seen, or where an elevated damp reading is found, the meter will be used to assess the extent of the damp both vertically and horizontally. If high damp readings are obtained, he’ll start to profile the area, to find out what the relative distribution of the moisture is. 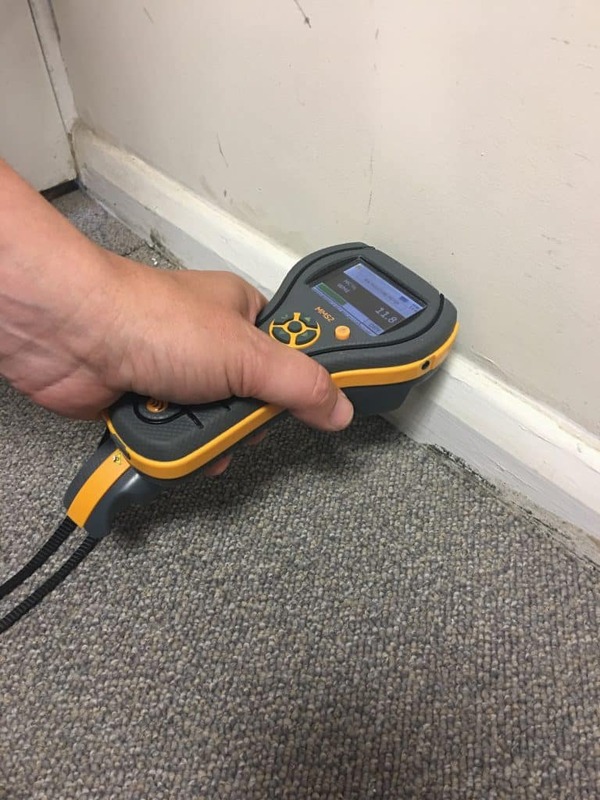 This moisture profile will help the damp diagnosis and combined with the visual internal and external inspection, it should allow a proper interpretation of the cause of the damp and how best to overcome the problem. 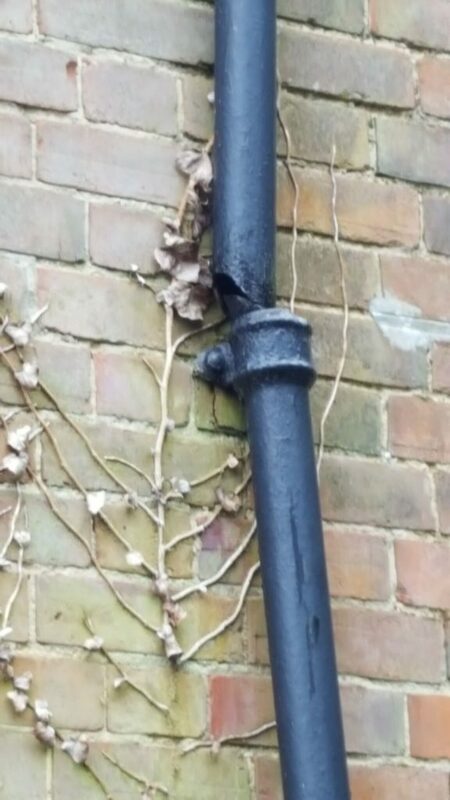 On occasions, our Surveyor may also use a thermal imaging device, which will help identify whether or not the damp is actually rising damp, damp ingress from the outside or, is in fact a hidden, leaking pipe. It is always best if you, the client, is able to meet with our Surveyor at the property, so that he can share his findings with you and show you the readings being obtained on the damp meter. The survey is carried out on a non-invasive basis i.e visual and with the aid of a specialist damp meter. We will not, at this stage be drilling holes in walls, removing plaster, skirting boards etc. It is important that our Surveyor has reasonable access to walls which are to be inspected because if they are not accessible, then they cannot be commented on. A damp report is usually going to be needed so our Surveyor will be taking notes, drawing a plan of the property and perhaps taking photographs during the survey, so that a clear written damp report can be issued. Recommendations, as to what to do about the damp (if anything) are an essential part of the damp report. When you meet with our Surveyor, please do talk to him and ask questions as the survey is taking place. It is very important to use only experienced, trained Surveyors, who will be accredited to CSRT (Certified Surveyor Remedial Treatments) and sometimes CSSW (Certified Surveyor Structural Waterproofing) level through the PCA (Property Care Association).